Yesterday I started on the upper patch in the quarter panel. Before I get into that, I want to show you one of the contributing factors to the rust in this area. 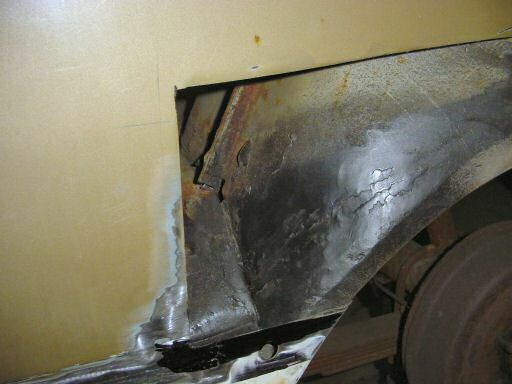 If you look at the bottom of the standing seam in the wheel well, you'll see that there's a big L shaped gap. 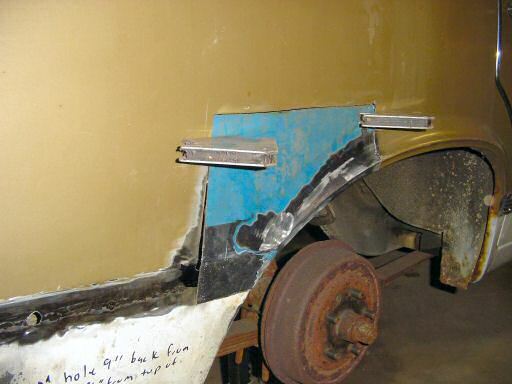 That was not cause by rust but is a result of a factory assembly problem on this side of the car. There was seam sealer in this area but it didn't completely seal the gap and made sort of a hood that directed water into the lower part of the quarter panel. If you get the feeling that the area I'm covering with this patch is a little bigger than it used to be, you'd be correct. I took a little different approach to fitting this patch and I'm pretty happy with the results. Basically, what I did was fit the front of the patch to the wheel well lip so it lined up nice there, lined up the body line, clamped the panel in place and cut through both the patch and original panels at the same time. I did that for three sides but I'll need to scare up some help to install some panel clamps so I can secure it before the final cut (that, or find some way to grow an arm out to eight feet long and add a few joints :^) ). Since I was at an impasse for finishing up the fitting, this is where I left things. Hopefully, I'll be back on it this weekend.